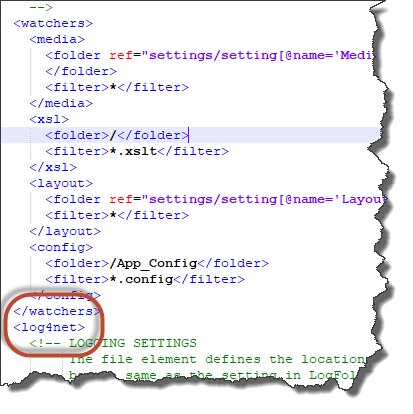 For another instance which had sc8.0, I added the appender & logger settings in web.config. But for 8.2, we can do it from the patch configs. Is that correct? You are correct in that you can patch in log4net settings in recent Sitecore releases. But your patch file is unrelated to your error, as Zach already pointed out. My guess; given that the missing config lies right above log4net - you removed this by mistake earlier. Sitecore.config needs to look like this. If this structure is found in your Sitecore.config and you don't see anything wrong with it (missing/mismatched closings, syntax errors, etc.) then first try removing all of your other custom patch configs and see if the error is fixed. If so, add them back one-by-one to identify the patch that is breaking your solution. If not, try replacing your Sitecore.config with one from a clean download of Sitecore 8.2 update 4.